On a sunny September morning in a rundown section of Brooklyn, firefighters watched television as reports of a plane crashing into the World Trade Center interrupted regular programming. 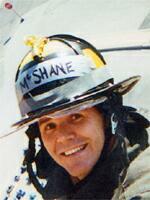 To get a better view, firefighter Terence McShane scrambled to the roof of the station house, located across the East River from the twin towers. When the call came in, he was ready to roll. Located at the mouth of the Brooklyn-Battery Tunnel in an area known as Red Hook, FDNY Ladder 101 and Engine 202 were called out in the second wave of units. While Manhattan crews got bogged down in morning rush hour traffic, the Red Hook Raiders sped the short distance through the tunnel, exiting in time to see the second plane hit the south tower. Seven men from Ladder 101, including McShane, were dispatched into the south tower to begin what they knew would be a dangerous mission. Their brothers from Engine 202 saw them enter as they waited in a staging area for orders. 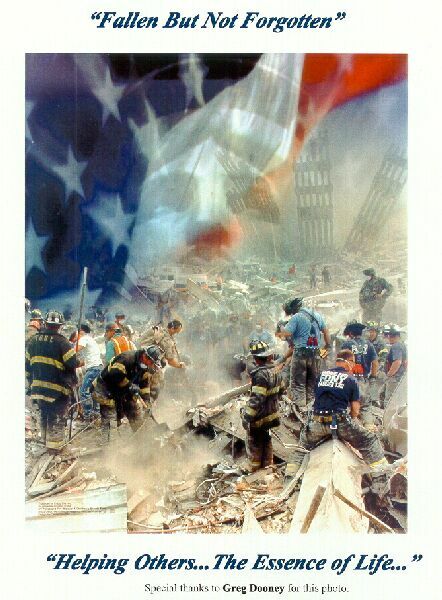 "We were there before the buildings fell," said Tim, a firefighter with Engine 202 who did not wish to be identified. "We were one of the original companies on the scene. I was with the guys that are missing. "They went in. I was with the engine. We were waiting to be assigned in," he says. Tim was in the street with three others from E-202 when the towers began to fall. The entire company of L-101 on duty that day was lost. The ruins have yet to relinquish four of them. Several miles away on Staten Island, Lt. Mike Delgrosso, L-101, was beginning his second day of vacation. "I was watching it on TV as it happened," says Delgrosso. "After the second plane hit, the department put in a recall. Everybody that heard it came into work." It took him more than two hours to get into the city. "All the roads were closed and there were traffic jams all over. The bridges were closed. It took some time to get over. If you had an ID card you could get over." Delgrosso says the last place firefighters from his company were seen was in the hotel between the two towers, heading for the south tower. "The second building took a better shot on lower floors," says Delgrosso. "I don't know if they guided it in just right, but it hit lower in the building. That building collapsed first." He says a lot of companies were just coming into the second tower while other companies were fighting fires in the first. "The people in that building had no indication at all that it would come down." The bodies of two firefighters from L-101 were found together, a third was found a short time later in the same general area. "We usually stay together as a unit," says Delgrosso. "One may have been split off, maybe 100 feet away. Generally in a high-rise like that we work as a unit. They were definitely in the first building that came down." While the firefighters of E-202 survived, there is no rejoicing. They and the remaining men of L-101 take turns volunteering to work a rotation at "the site," sifting through the rubble. Delgrosso says for the first two weeks after the attacks, most of the firefighters from the Brooklyn company worked at the site, except for the on-duty crew at the firehouse. Now they typically have one firefighter working at the site. Some of the firefighters can't go back. "It's different if you were there before (the towers fell), then after," Tim says. "There are certain sounds that make us envision things we don't want to envision." He didn't elaborate and we didn't ask. We already know. Other firefighters on the scene that day have spoken of the horror of seeing people jump from the upper floors of the towers and of the memory of that sound. "People that got there after us don't have those images," he says. If he is ordered to go, he says he will go. In the meantime, the men he works with understand how he feels. "They step up to go so I won't have to volunteer." Naturally. That's what brothers do. 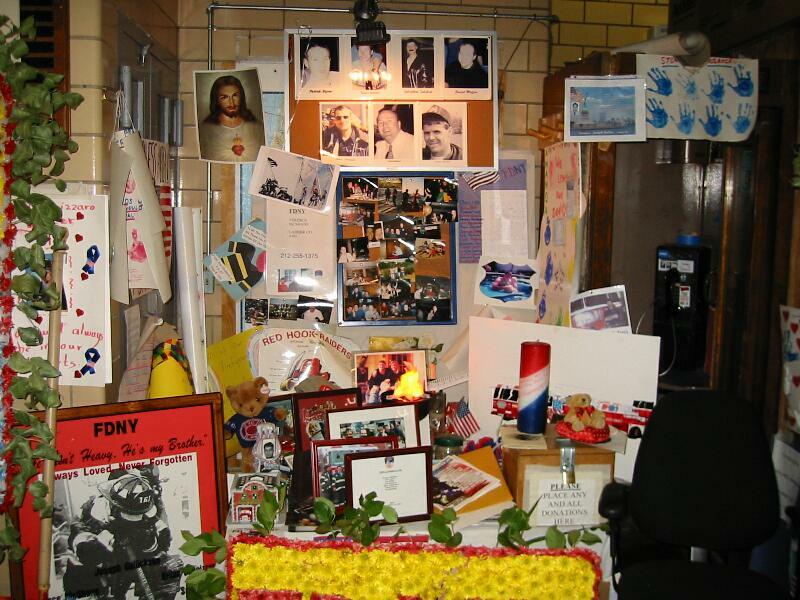 The Brooklyn firefighters are amazed at the outpouring of sympathy and affection they have received. "The outcry from the whole country has been wonderful," says Tim. "The kids alone made it wonderful. It shows there is humanity and that people care. It's as simple as that." Delgrosso says it is amazing to see how much people care. Hershey Chocolate sent the firehouse containers of chocolate Kisses and one day, Arnold Schwarzenegger stopped by to shake hands. "Unfortunately, I wasn't there that day." The firehouse is located in what used to be one of the busiest pier points on the East River. Once a blue-color community, Red Hook is now a ghetto of abandoned buildings and warehouses and one of the poorest neighborhoods in the city. Most residents live in public housing projects. In the days and weeks following the attacks the people of Red Hook placed flowers and candles on the sidewalks in front of the firehouse. Pictures, cards and letters were hung on walls. Food and money was donated too, even if it was just a couple crumbled dollar bills or some canned goods. The firefighters have been touched by the response from the impoverished neighborhood. 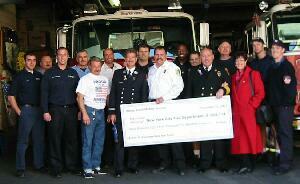 Every dollar donated is deposited in the Richards Street Heroes Fund. "The widows will have everything they want but a husband," says Tim, "and that's what they're hurting for." 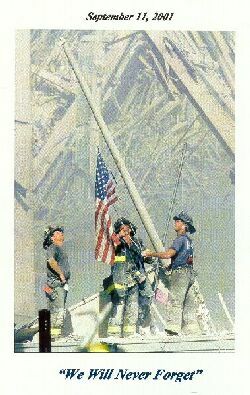 Although firefighters have essentially become the heroes of the new millennium, it's not a mantle they wear comfortably. Tim visited a school where his in-laws live to thank them for cards sent to the firehouse. "They treated me like a superhero," he says. "I'm not a hero. I wish we didn't have any hero worship. I wish they were all back here and we were just regular guys." It's been more than four months since the attacks that claimed almost 3,000 lives, including 343 of New York's bravest. "I'm doing all right," says Delgrosso. "I exercise. I have coping methods. We're dealing with the families and the other members. It doesn't just stop at the incident. It's not going to go away for awhile." While Delgrosso and his fellow firefighters try to endure the atrocities that have been heaped upon them, it is difficult for them to find some type of closure. Delgrosso lost many friends on Sept. 11, including his best friend, Greg Buck. Buck was a firefighter with Engine 201. After waiting more than two months, Mrs. Buck planned a memorial service for her husband. Although it was painful, it would begin the healing process. The memorial was held on Nov. 30. In late December, Buck's body was recovered. Another funeral was held on Dec. 29 and he was finally laid to rest. Freshly healed wounds were torn open. "For the most part, there are more good days than bad days like in the beginning. But if they find somebody, it brings it back. It hasn't ended yet." When the body of a firefighter is recovered and can be identified, his company is notified. Delgrosso says whoever is on duty will go to the site. When the company arrives, the firefighter is placed on a stretcher. His body is covered with an American flag and he is saluted. His company then carries him out. The ritual is a long-standing FDNY tradition. For now New York City remains a somewhat somber but more appreciative place. "We're more into hugging people and happy to see people we haven't seen in awhile," says Tim. "It (the terrorist attacks) touched reality. We're more apt to be happy and hug somebody hello, but we're more somber." 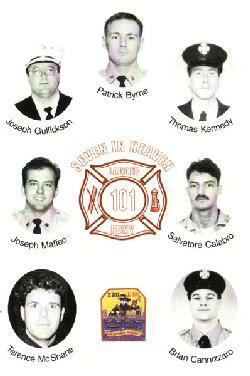 In addition to the loss of seven brothers, L-101 and E-202 lost their rigs when the buildings collapsed. "Right now we are using spare apparatus provided by the city. We have no idea when we would get a replacement. It's a waiting game. So many rigs were lost," says Tim. But L-101 can expect a new ladder truck sometime in the not-too-distant future. Soon after Sept. 11 children at White Knoll Middle School in Columbia, S.C. began collecting money to purchase a new fire truck to replace the one they lost. The truck is payment for a 134-year-old debt. After the Civil War, New York sent the city of Columbia a new horse-drawn firefighting carriage. With the help of other schools and many businesses, the students raised over $600,000. Although the children's effort was a tremendous one, it is far easier to replace a piece of equipment, even such expensive equipment, than it is to replace any of the seven men who died. To keep the company up and running, firefighters are assigned out of other companies not affected by the tragedy. "They come in for 60 days, or we get probies (new probationary firefighters)," says Tim. "New assignees fill out the company, but they're not going to replace the guys. "Each one was a special part of the company. Each one is a guy you would want at your house for a barbecue." His voice markedly softening he adds, "Many of them were at my house." In fact, Tim has a picture of lost firefighter Brian Cannizzaro in his pool with his son. It was taken two weeks before the attacks. "It's a good picture," he says quietly.